Joseph lost his mother Sharon only hours before the start of play on Day three. It was a sad day for Windies Cricket despite the emphatic win in the second Test against England. While they scripted history, one of the team members, Alzarri Joseph lost his mother Sharon Joseph hours before play on Day three. Yet, Alzarri came out to play the game and contributed massively to the win. He picked up the wickets of debutant Joe Denly and the dangerous Joe Root in the second innings to help his side gain an advantage. Even though he was physically present on the field, all his thoughts were with his deceased mother. Each of the Windies team members as well as the support staff hugged him and tried to cheer him up after the win as he trudged off the field. Furthermore, the English players were spotted wearing black armbands to pay their respects. Jason Holder further mentioned that they wanted to win the match for Alzarri Joseph. He informed that the talk in the team huddle was just about that. The skipper termed the youngster a champion and said that it was Joseph’s decision to play the game. “When we came together in the huddle we just wanted to do it for him. He wanted to play and I couldn’t deprive him of the opportunity. We dedicate this day to him and his mum and also to his family. 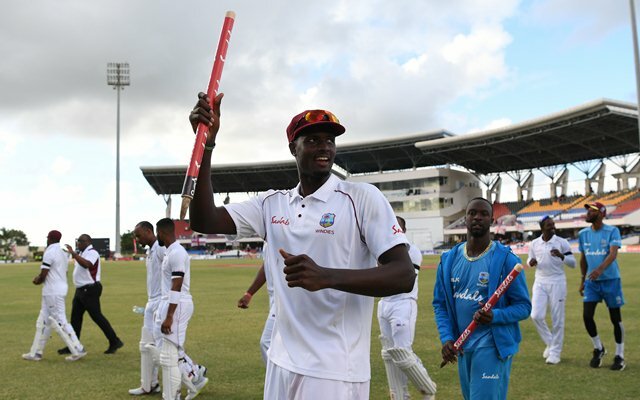 He’s a champion,” said Jason Holder.